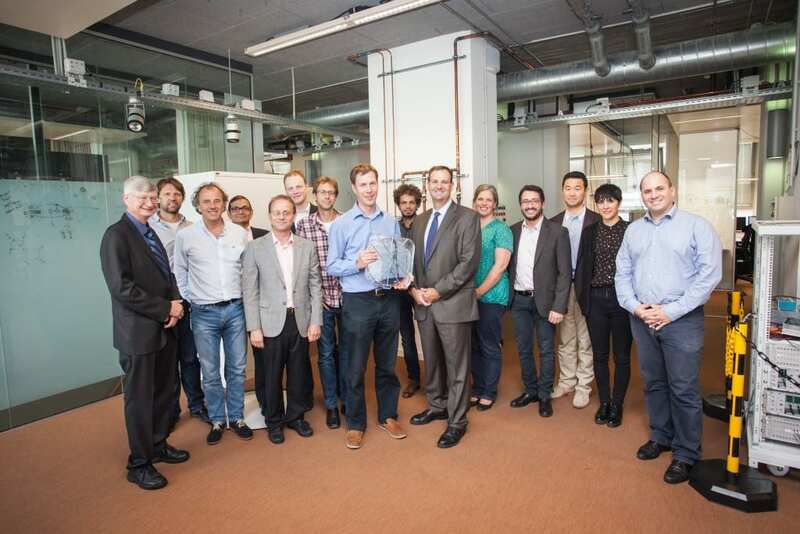 American chip manufacturer Intel and QuTech, the quantum institute of TU Delft and TNO, have finalised plans for a ten-year intensive collaboration. Alongside financial support for QuTech totalling approximately $50 million, Intel will also contribute expertise, manpower and facilities. “QuTech is delighted to welcome Intel as their new partner. The major challenge facing quantum technology development in the coming decades, such as creating a quantum computer, is set to be upscaling: being able to create complex structures with an enormous number of quantum bits. This partnership will enable us to combine our scientific expertise with the best engineering expertise in the computer industry”, says lead scientist Lieven Vandersypen of QuTech. Expertise in specialized electronics combined with advanced physics is required to move quantum computing closer to being a reality,” comments Mike Mayberry, vice president of Intel and managing director of Intel Labs. “While qubit development has been the focus of quantum computing research to date, low-temperature electronics will be required to connect, control and measure multiple qubits, and this is where we can contribute. Our collaboration with QuTech will explore quantum computing breakthroughs that could influence the industry overall”.